Whether you are moving large quantities of liquids over the road or within a plant, industry leaders know that IBC totes offer an efficient and safe solution for their liquid packaging and handling needs. 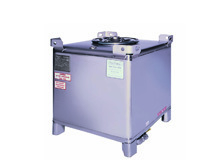 Stainless steel IBC totes satisfy industry requirements for handling flammable material, high temperatures, stringent product compatibility and hazardous and non-hazardous liquids. And, intermediate bulk containers offer versatility when used as a processing and/or mixing vessel. Lower your labor costs. 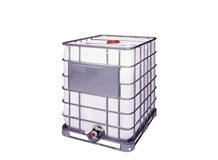 The time spent filling, handling, draining and storing is significantly reduced. Workplace injuries are also reduced. Conserving capital expenditures – You can start utilizing stainless steel IBCs today without making an initial large cash outlay. No minimum or maximum term required. Flexibility to increase or decrease your fleet size as your needs change. Never own obsolete assets. Renting ensures you always have an updated fleet. 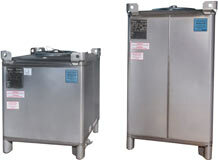 Stainless steel IBCs provide a cost-effective, reliable method of handling, storing and shipping liquids. Our 275-gallon poly-composite IBCs are made from blow molded HDPE and a rigid welded galvanized tubular steel grid. IBC rentals from Metano are the right option for manufacturers seeking to green their processes.